Having key food items on hand will make last minute meal preparation easy. Being able to entertain when friends or family stop by unexpectedly is always a challenge. But, if you have some basic food items on hand, you'd be surprised how easy it is to put together an appetizer or full meal for your guests to enjoy. 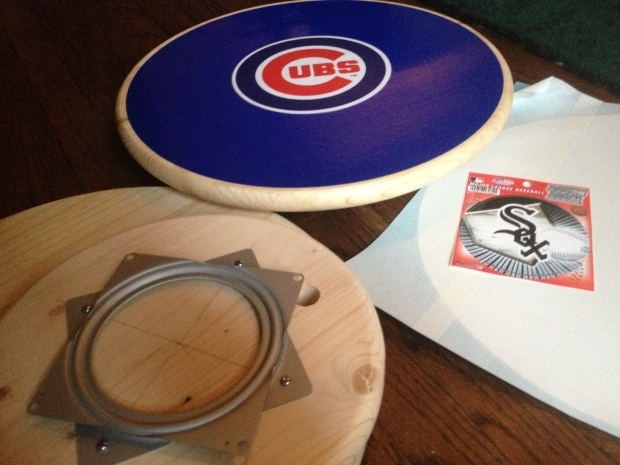 I asked my Facebook friends for an inventory of the items they always have on hand. Their creative and, in some instances, humorous ideas and suggestions are on my page. From their comments, I created this list of common elements. You don't need to have all of these in your pantry or refrigerator, but a good mix will give you a base for a number of simple recipes. Drawing from this list, I've created two simple entrees and an appetizer. Pasta or Rice - Keep either one or both on hand. They last a long time on your shelf and can be prepared in less than 30 minutes. Dried Herbs & Spices - These will always add a bit of flavor to anything you're throwing together at the last minute. Oregano and thyme would be tops on my list of herbs. Frozen Shrimp - Frozen raw and deveined shrimp can be thawed quickly and cooks in minutes whether you're boiling or sautéing. Smoked Meats - Smoked meats that are vacuum sealed last for a long time before they are opened. And, once opened, they are still good for about a week. They are fully cooked and can be sliced or chopped and added to a number of dishes. Canned Goods - Tomatoes, beans, whole kernel corn, and chicken stock are all long shelf live items that are incredibly useful to have on hand. Crackers - Crackers can be used for appetizers or as a thickener in soups and casseroles. 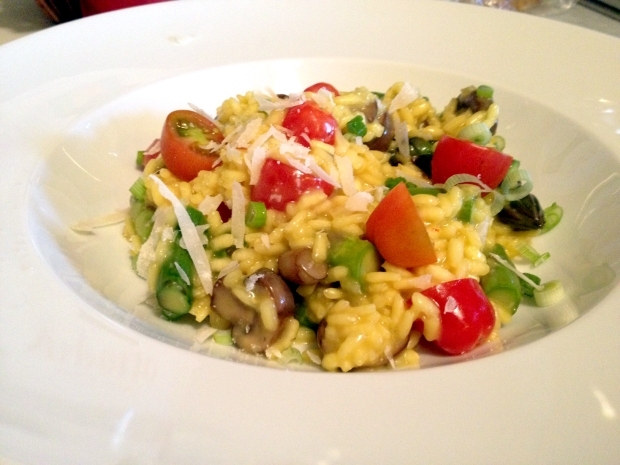 Wayne shows you how to make a summer risotto using mushrooms, asparagus, saffron and Parmigiano-Reggiano cheese. Defrost shrimp by placing them in a large bowl of cool water. Stir the shrimp occasionally to speed up the process. Once fully thawed, rinse and drain. Set aside. Separately, melt butter in a large saucepan over medium low heat. Add onions and garlic and sauté until onions are tender and translucent, about 5-7 minutes. Increase the heat to medium high and add tomatoes and oregano. Sauté for about 2 minutes and add chicken stock. Cook, stirring often, until mixture reduces a bit, about 10 minutes. Add shrimp and sauté until shrimp turn pink and are cooked through, about 3 minutes. Pour mixture over pasta and toss to combine. Serve with grated parmesan if available. Bring 2 cups of water to a boil in a medium pot. Add 1 tablespoon of butter and 1/2 teaspoon of salt. Add rice and stir. Cover the pot and reduce heat to a low simmer for 20 minutes. Separately, slice half of the sausage at an angle into 1/2" slices. Dice the remaining sausage. Heat remaining 2 tablespoons of butter in a saucepan over a medium heat. Add sliced sausage and sauté until brown, about 3-4 minutes. Remove and set aside. In the same pan, add onions and sauté until tender, about 5 minutes. Add diced sausage and sauté for an additional 2 minutes. Add tomatoes and thyme, sauté for 1 minute, and then add chicken stock. Cook, stirring often, until mixture reduces a bit, about 10 minutes. Add corn and heat through, about 2 minutes. Season with salt and pepper, to taste. Form a large ring of rice on a serving platter and spoon sausage mixture into the center. Top with sausage slices and serve. Preheat oven to 250 degrees F. Melt butter in a saucepan over medium hight head. Add saltines and stir until saltines are brown and crispy, about 3 minutes. Transfer to a plate to cool slightly. Spray muffin pan with cooking spray. Put about 1 teaspoon of toasted saltines in the bottom of each cup. Cover saltines with cooked pasta making sure no stray pieces are resting outside of each cup. Whisk the oregano into the eggs and slowly fill each cup with the mixture. 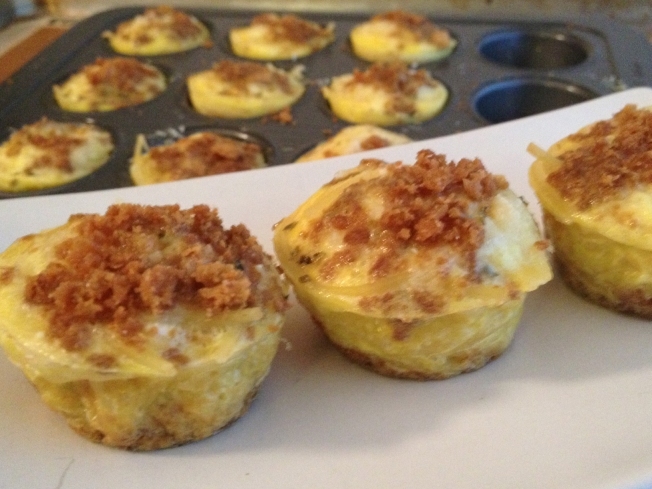 Sprinkle cheese on top of eggs and then sprinkle remaining saltine crumbs on top of cheese. Bake for 15-17 minutes until quiches have risen and held their shape. Remove from oven, allow to cool slightly, and server warm. Thanks once again to all of my Facebook friends for ideas and suggestions. If you have any comments or questions, please send me an email at wayne@waynesweekend.com or follow me on Facebook or Twitter.